Today, I was going to write a post related to ecological matters, but I just stumbled upon an article from the magazine Mother Jones which I thought was very much worth sharing. Indeed, the journalist Dave Gilson has recently wondered what if members of the US Congress were seated not by party but according to the industries which gave them the most money over their entire careers? Interesting question indeed. 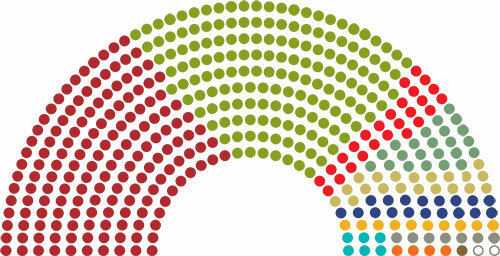 He gave it a try and presented the following charts, representing lobbies “seating” at the Senate and at the House. I copied both charts below, as well as a selection of interesting Congressmen’s profile based on their top donors. There is nothing original in saying that most politicians evolving at national levels have intricate links with major industries, but Mother Jones has done a stupendous job in presenting it clearly. I wished we could see such work done in other countries, or even at the European Union level. Top donors: The ranking member of the agriculture committee has never met a federal farm subsidy he didn’t like. He just happens to be Congress’ second-most bountiful recipient of agribusiness cash. Top donors: Inhofe, who’s declared that “man-induced global warming is an article of religious faith,” has received more money from Koch Industries than any other company. The oil firm has given nearly $25 million to climate-change denial groups. Top donors: The chair of the appropriations committee and a subcommittee with oversight of labor matters, is the House’s second-biggest recipient of union cash. Top donors: Barton, who decried the “shakedown” of BP, has watched the cash flow from Anadarko Petroleum, owner of 25% of BP’s Deepwater Horizon well. Top donors: The Armed Services Committee chair is—surprise!— Congress’ top recipient of defense-industry cash. In addition to these charts and profiles, Mother Jones has also listed Congress’s top 75 corporate sponsors. You will probably not be surprised to see that are present in the list major financial players such as Goldman Sachs, Citigroup, American Bankers Association, JPMorgan Chase, Morgan Stanley, Merryll Lynch, AIG, Freddie Mac, KPMG, UBS and Credit Suisse. Among the Defense contractors, you will find Lockeed Martin, Boeing and Northtrop Grumman. Perhaps unsurprisingly tobacco industries such as Altria (parent company for Philip Morris USA) and US Smokeless Tobacco Company are also on the list. Interestingly, the list also includes Koch Industries Inc, involved in refineries, chemicals, fertilizers, etc; ADM, agribusiness leader; and naturally oil companies Chevron and ExxonMobil. I can’t help but think that all of these names are somewhat linked to something that went wrong, whether we talk of the global financial crisis, the war in Iraq, lies from the tobacco industry, genetically modified organisms or oil related environmental disasters. Now, some people talk of the need to moving toward a ‘responsible capitalism’. Given that money seems to be more important than values, I seriously doubt it is possible. This is really interesting – I’m actually surprised by the small number of ‘Energy and Natural Resources’ seats. Do these areas also get represented through Finance and Lobbyist seats? Or isn’t the number of seats representative of the power they hold?? According to Mother Jones’ methodology, “All charts in the Who Owns Congress? package are based on federal election data compiled by the Center for Responsive Politics. Recalling some shocking conflicts of interests in countries such as the US (“Half of all US senators become lobbyists when they leave the Senate, often working for the businesses they previously regulated”)or France, the author adds that “in the past 20 years, with former Soviet apparatchiks who turned themselves into oligarchs and Chinese bosses who hold office in the Communist Party, with European members of the parliament, ministers and executives who go through a US-style revolving door to the private sector, and with the Iranian clergy and Pakistani military intoxicated by the world of business – the slide towards corruption has become systemic. It inflects the political life of the planet.” Indeed.